poprawia pamiec, jasnosc umyslu - w pracy jestem duzo bardziej produktywny i skupiony - najlepszy suplement jaki mozna sobie zafundowac ! naprawde polecam! Pierwsza proba - totalne splatanie, wylaczony na okolo 6h. Druga proba - to samo. Trzecia proba - to co wyzej + wymioty. Nie wiem o co chodzi, ale w moim przypadku okazalo sie to kompletnym nieporozumieniem. Witam, mam zamiar kupić ten suplement. Czy wystepuja u was jakieś skutki uboczne podczas brania tego suplementu lub po jego odstawieniu? Działa i to bardzo dobrze, jasność umysłu, lepsza pamięć krótkotrwała. 2 kaps. na raz/dzień. Take 1-2 capsules a day, with or without a meal. 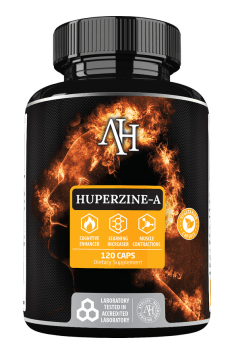 Huperzine A proves fantastic in times when you have to assimilate a lot if information, for example during an exam session or more intensive trainings. Because of its long duration, there is no need to split the daily dosage into several portions, you can take the whole dose at one time. The substance’s water-solubility suggests that there is also no need to take huperzine with a meal, it should be absorbed just as efficiently on an empty stomach. Basing on the rule of the minimum efficient dosage, it is good to start supplementation from one capsule a day and observe the visible effects; then, if there is a need, the dosage can be doubled. Higher doses should be consulted with a doctor, as they are usually used for a specific purpose, like treating Alzheimer’s disease or supporting the fight against addictions. The duration of supplementation is not specified. In times of greater demand, it is good to use it regularly but using it only when needed is also efficient. In order to support the functioning of muscles and improve physical shape, it is recommended to take it 30-60 minutes before a planned activity. An interesting application is also using a standard dose of huperzine in the evening in order to intensify your dreams; however, it is unadvised to do it regularly. Muscle-Zone answer: Witamy, nie nie występują.